It’s a warmer spring day today. Finally! I promised more photos so I will keep the text brief. 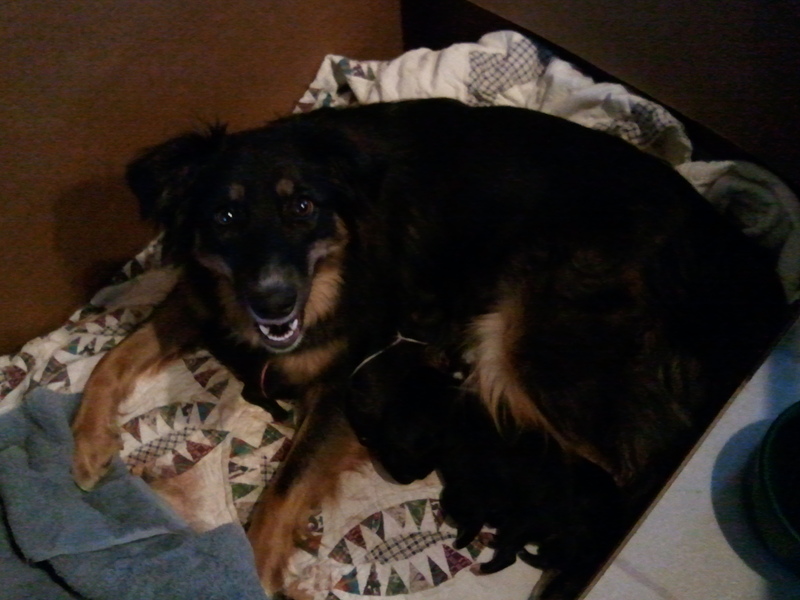 Above, is two-year old Shetland Bonnie with her 50% Finn lambs. The ewe lamb on the left has pretty white markings in her lighter brown fleece and her brother is a rich, dark chocolate-brown. 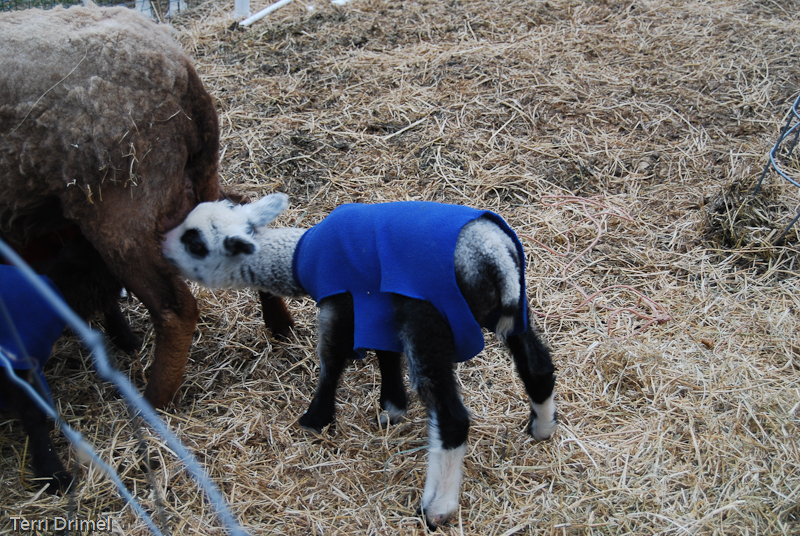 This is Bonnie’s first lambing and I am pleased to report that she is an attentive and excellent mother. Above is the gray Finn ram lamb sneaking a drink of milk from Bonnie. 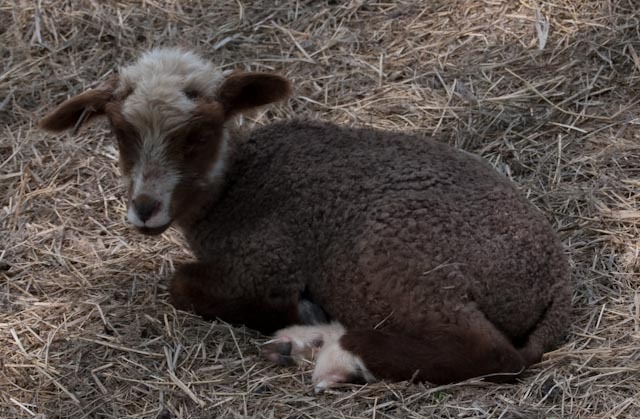 This boys mom, Finnsheep Little Red Oak Kiia, has been a reluctant new mother. I have kept a close watch on them – she doesn’t let him nurse for long. I’ve felt his teeth and they don’t feel sharp. And Kiia’s bag feels normal so he is getting milk from her. I will keep monitoring them and supplement bottle-feed him through the fence, if needed. 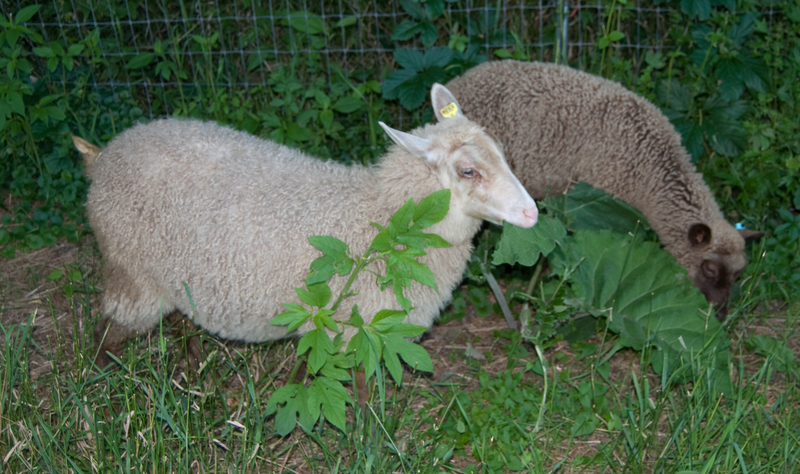 We have two new additions to our Finnsheep flock! The first ewe lamb is from Gale Woods Farm. Her body is white but her legs are brown and gray with white socks on the rear legs. Her hooves are very light brown with some white. At this point her fleece is white to the roots and her skin is pink. She has a very dense, heavy coat with a nice crimp. 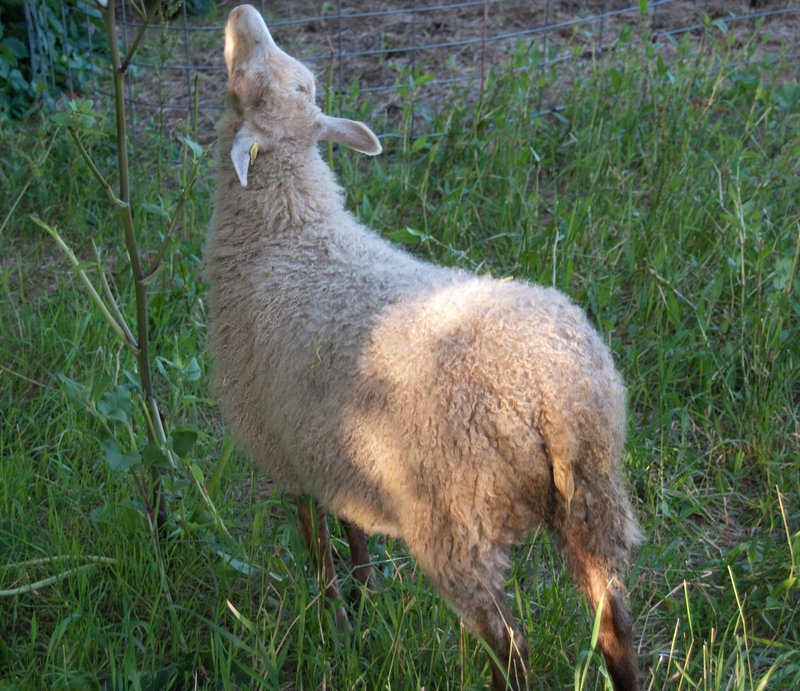 In the photo, her rear end is wet – I think she got “wee’d on” by the other lamb when they were in the crate on the ride home. 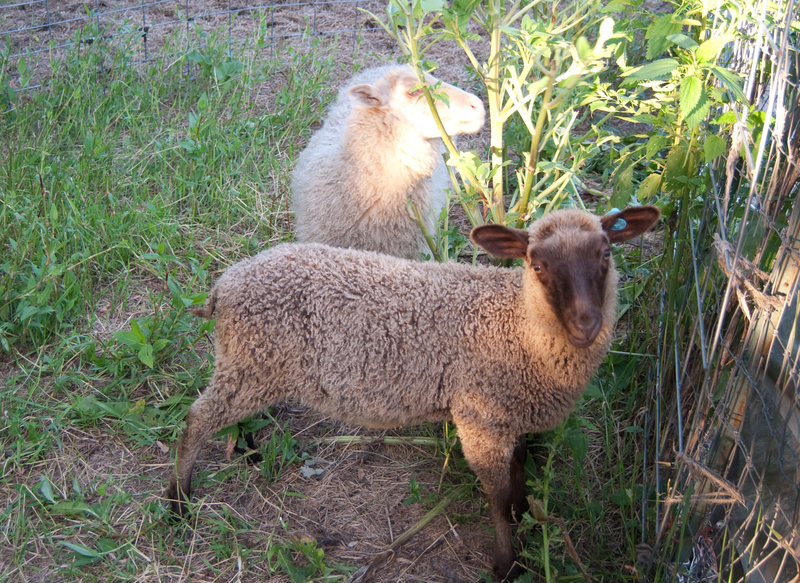 And since I love the natural brown Finnsheep, I brought home a lovely ewe lamb from Little Red Oak Farm. Leila is a twin with wonderful fleece. 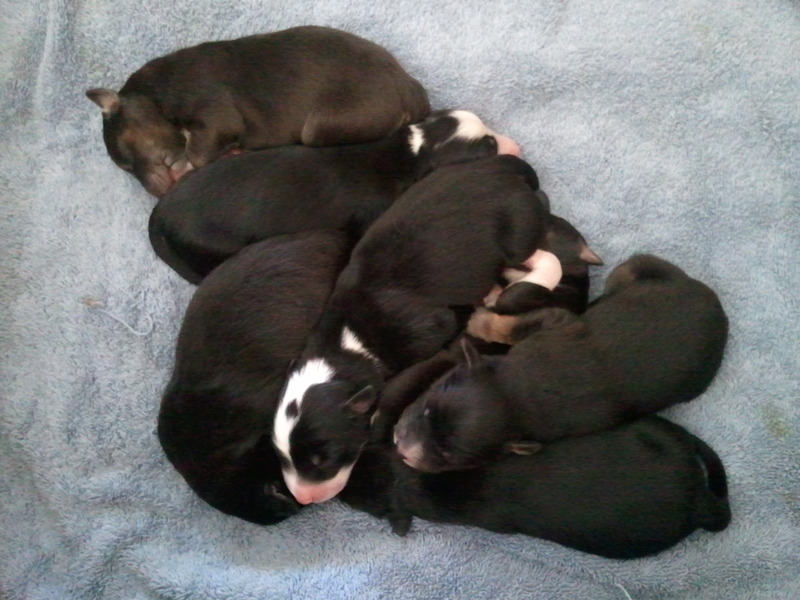 I am happy to report that we now have five Finnsheep ewes and two rams in all the colors – white, black, brown, and gray. We have spots and (hopefully) modified/Ag genetics. Ooh, I can’t wait to see the lambs of 2011! Lamb Photos – Can We Ever Get Enough?? I love looking at lamb photos! 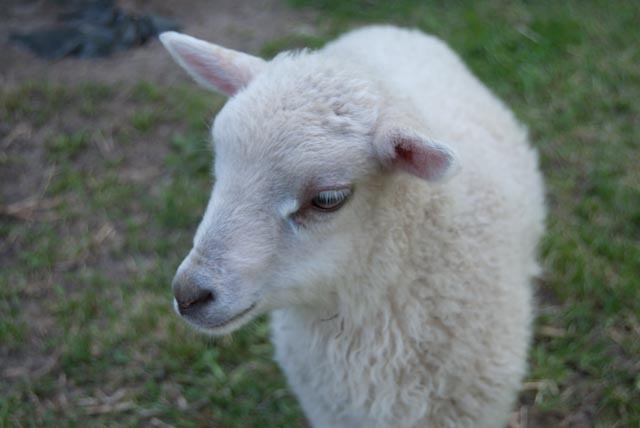 Today I will share some recent shots of our adorable lambs, mostly Finns. Enjoy! Eeva is no longer receiving a supplemental bottle. She is a very friendly ewe lamb who runs up to me anytime she sees me. She loves her chin scratches! This photo clearly illustrates the color difference between the brown hair on her head, face and legs and the lighter brown of her fleece. Her fleece color is consistent from tip to root. I’m not sure of modified colors in Finns yet. When I compare her color to her sire Eino, she is much lighter; I wonder if she carries a modifier gene and is a fawn color? It will be fun to watch her color as she grows and I’m anxious to see what she will pass onto her lambs. 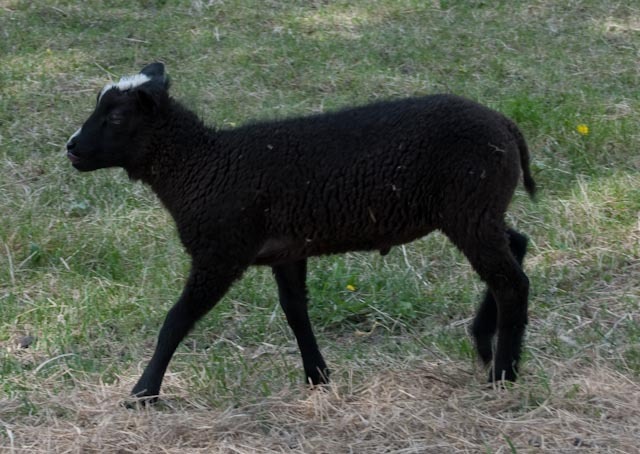 I have read on several websites that brown Finn lambs are less than 2% of the Finn population. I don’t know if this is true and I am looking for a report that verifies this. When/if I find that information, I will pass it on to you. I am going to concentrate somewhat on the brown color, not just because it is rare but because I love it in it’s natural state and I’m anxious to try some overdyeing! This photo was taken right after I removed his fleece jacket. He is growing nicely and looks to have nice fiber and confirmation. He is FOR SALE as a breeding ram or he could be whethered. He carries BROWN and spots. I still haven’t committed to a name for this black Finn ram lamb. He is growing nicely, is respectfully curious but not overly so, just as a ram should be. He is spotted black and carries brown and is FOR SALE. Shetland twin ewe lamb Phyllis loves her chin scratches! Shetland ewe lamb Phyllis is the one that I had to help deliver. She and her brother Curly are very friendly; she also runs up to me and waits for a chin scratch. Her fiber is coming in with a consistent wave – it doesn’t look very crimpy at this point. Her dam and sire both have great fiber so I’m sure she will. She will be one of the few Shetlands we keep on our farm. 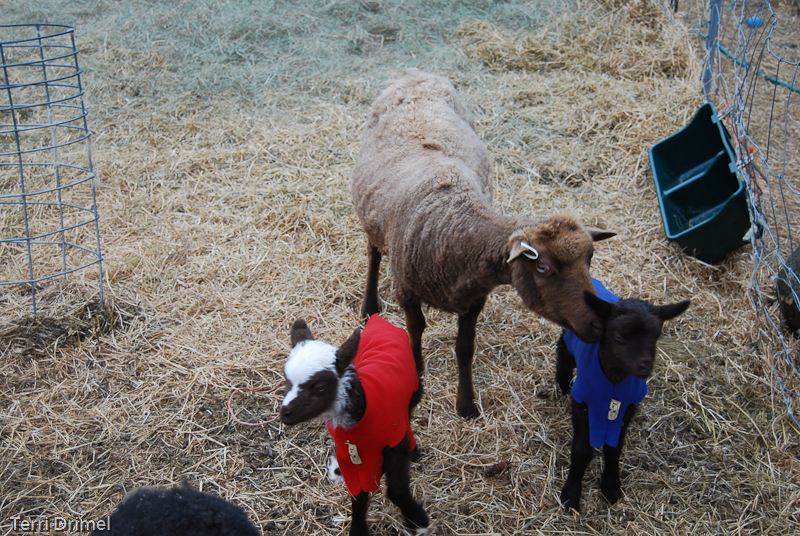 Finnsheep triplet lambs with shetland mule ram lamb in the background. And finally, another photo of Finn lamb Eeva. Three of her four feet are spotted white and she has the white spotting on her head. She does not have spotting on her tail. To me, this is the same type of spotting that Shetland breeder Nancy Krohn defined as HST (Head, Socks, Tail) spotting in Shetlands. Nancy’s thoughts on the subject may be found here. I want to begin this post by saying that I am in no way an expert on genetics! I have the rudimentary knowledge that one gains from several college biology courses. I am just learning how to classify my sheep’s genetics. In my quest to discover more about sheep color genetics, I have found a wealth of information on the internet published by Shetland, Gotland, Icelandic, Finn and other sheep breeders. I will include the sites on the Links page. 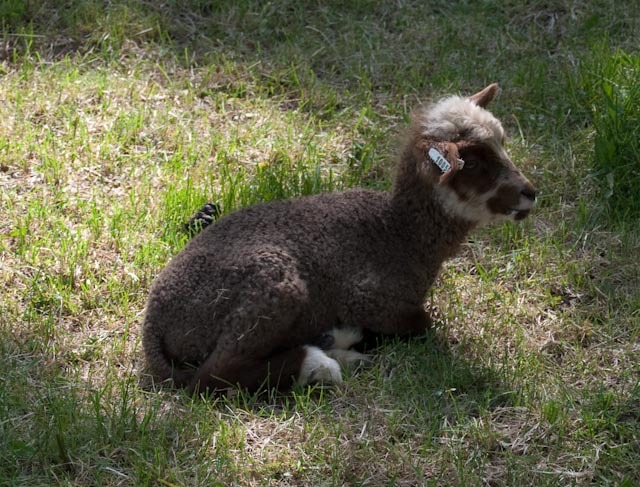 The first link is by Shetland breeder Lanette Scapillatto – Color Genetics of Icelandic, Shetland, and Finnsheep. This information is based on work by Stefan Adalsteinsson, PhD in 1970 and the World Congress of Coloured Sheep in 1989. Click on the site for specifics. The information on this site is clearly presented. The next link is the fantastic information on color genetics presented by Shetland breeders, Linda Wendelboe and Kathy Baker. In addition to genetics information, their site has a wealth of information and photos on the Shetland breed, patterns, fiber, etc. At Tongue River Farm, Susan Mongold raises Icelandic sheep. She wrote an article on Color Genetics in Icelandic Sheep. Her article was published in The Shepherd Magazine in June 1997. Franna Pitt, PhD raises Shetlands and Gotland sheep at Ever Ranch. She has published a detailed paper entitled Colored Genetics of Gotland Sheep in North America. I have only begun to study this paper and it is excellent. Franna’s paper pointed me to Deer Run Sheep Farm‘s website which has a paper written by D. Phillip Sponenberg, DVM, PhD, on Color Genetics in Coopworth Sheep. Even if you are not interested in genetics, check out this website because it is packed full of fiber, farm and website design related links! A big thank-you to the Martha and Jim McGrath for their fabulous site! 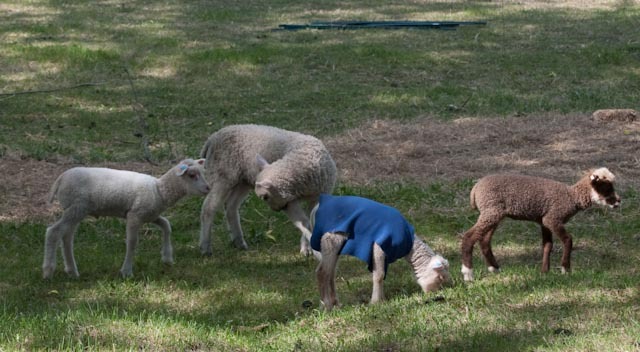 And finally, Yahoo has a group on sheep color genetics. There are frequent and interesting discussions on color genetics of various breeds of sheep on this Yahoo group. The Finn lambs are growing nicely and starting to fill out their jackets. Based on what I have gleaned from this genetic information, I would list triplet Finnsheep ewe lamb Eeva (left) as Aa/Aa Bb/Bb Ss/Ss. 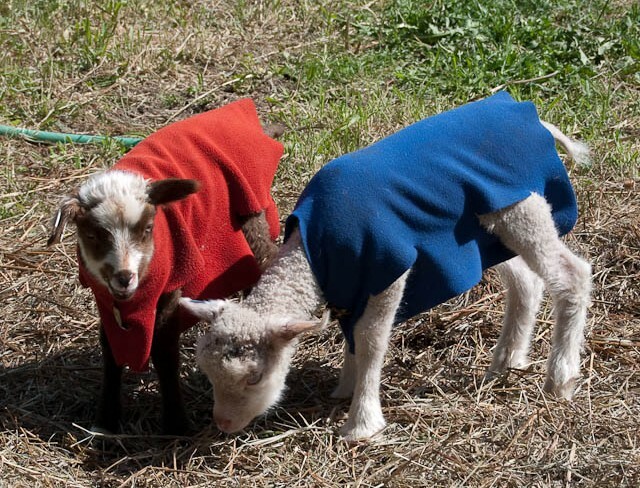 Underneath their jackets, both lambs are solid color. Her ram lamb brother (on right with dirt on his head) is all white from a spot carrying brown sire and spot carrying white dam. If that was the only information I had, along with knowing that white is a pattern, I would list him as Awt/A? B?/Bb S?/Ss. Comments from the more experienced shepherds are welcome! I hope you find these links as informative as I did. 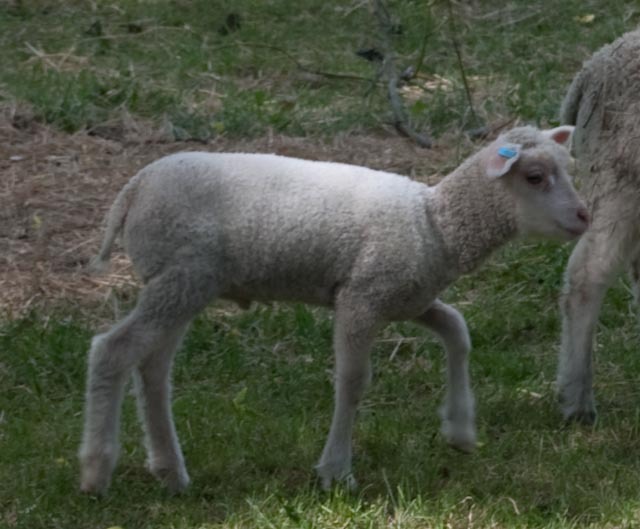 In one of my upcoming posts, I will list the rationale for the genetics of our Finn lambs. In the meantime, we are in the midst of a lovely Minnesota day! I have a vegetable garden to work on and lambs to be whethered and vaccinated. Have a great day!